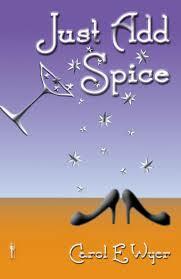 Just Add Spice – Carol E. Wyer Blog Tour and Giveaways! Welcome to the Just Add Spice Blog Tour! We’re taking Carol E. Wyer’s latest book to some of the world’s best book blogs for a fun ride full of reviews, guest posts and amazing giveaways. Get involved for the chance to a win something steamy for the bedroom, a signed paperback and a spot on one of Keris Stainton’s writing courses . . .
Where do you write your books? I usually write in my office which is a converted bedroom. However, this time, I wrote somewhere completely different. 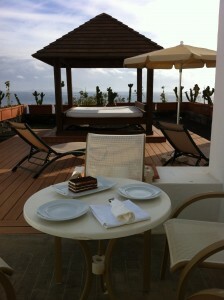 I wrote Just Add Spice in a luxury suite at a top hotel on the island of Lanzarote. I started Spice while on holiday at the Hotel Volcan, Lanzarote. The place looks like a volcano and is astonishing inside. You go into reception at the top of the volcano where lo and behold there is a waterfall that cascades to swimming pools below. Anyway, I won’t do my travel agent bit here, because there is sufficient description in the book. I was so mesmerised by the hotel that I decided it was the ideal destination for my character, Dawn Ellis. At a drinks buffet hosted by management at the hotel, I mentioned I was writing a book and asked if I could have some more details to make the book realistic. I wanted the character to escape to the ‘Adults Only’ area of the hotel where there are Balinese beds and open-air Jacuzzis to enjoy and fabulous views of Fuerteventura and the Marina Rubicon. Management was delighted to give me all the background information on the hotel and when I returned home, they sent me photographs of the top suite in the hotel, the magnificent Tao Suite, owned by the hotel owner and never let out to guests. It was perfect for my final scenes. It had a giant Jacuzzi bath for at least two people in the bathroom and a four poster bed in the bedroom. It was superb. As it happened, we had booked a return trip to the hotel to celebrate our 25th Wedding Anniversary in January. I was on edits of Spice by then. Imagine my surprise when the girl at reception called out the manger to greet us on our return and we were escorted to stay in…the Tao Suite. They wanted me to be able to inject authenticity into the book. I rewrote the final chapters to do the place justice, as the photographs did not really show how splendid it was. The Hotel Volcan couldn’t have been more accommodating. I would have recommended the hotel to anyone prior to being treated so well, but now I gush about it at every opportunity. Tao is a Chinese concept signifying ‘way’, ‘path’ or ‘route’ and it most fitting for the ending. In Taoism you learn to harmonise with Nature and find peace within. I couldn’t have chosen a better place. I am most grateful to the owner and management. 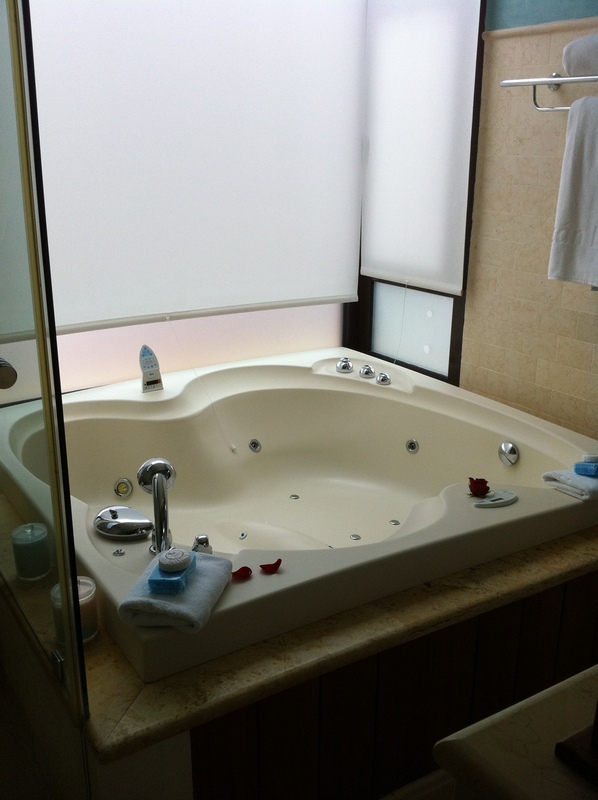 As for that double Jacuzzi…well, it certainly added some spice to our holiday! Carol E. Wyer is an award winning author whose humorous novels take a light-hearted look at getting older and encourage others to age disgracefully. Her best-selling debut novel ‘Mini Skirts and Laughter Lines’ won five awards for humour. ‘Surfing in Stilettos’ which follows the further adventures of Amanda Wilson as she attempts to inject some fun into her life, was a Costa Award nominee. Safkhet Publishing released ‘How Not to Murder Your Grumpy’ June 1st 2012, the first of three books in a ‘Grumpy’ series. 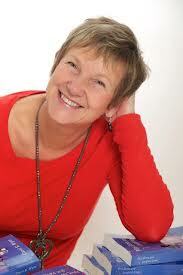 Carol has featured on numerous shows discussing ‘Irritable Male Syndrome’ and ‘Ageing Disgracefully’. She has had articles published in national magazines such as Woman’s Weekly’ and on-line magazines. She writes regularly for The Huffington Post and author website Indies Unlimited. She is a signed author with ThornBerry Publishing and Safkhet Publishing. Want to write a novel for teenagers? This 6-week online course will help you come up with inspired ideas; create believable characters; write convincing dialogue; grab readers right from the first page and keep them hooked to the last. An 4-week online course to help you move on when your first draft is done. Giveaway closes 30th November 2013. Keris Stainton reserves the right to alter the times of this giveaway at any point. Add a little spice to the bedroom with Carol’s essential kit: Pink handcuffs, I (heart) Spice Underwear and some lovely Old Spice aftershave. Giveaway closes 30th November. UK Only. A big thank you to Carol for coming along today- and GOOD LUCK with the competitions everyone! !